What Are Spektrum Glasses Best For? Two words to describe these sunglasses? Sporty and utilitarian. These polarized sunglasses by Mira are a great budget pair of shades that work wonderfully for all sorts of outdoor activities. 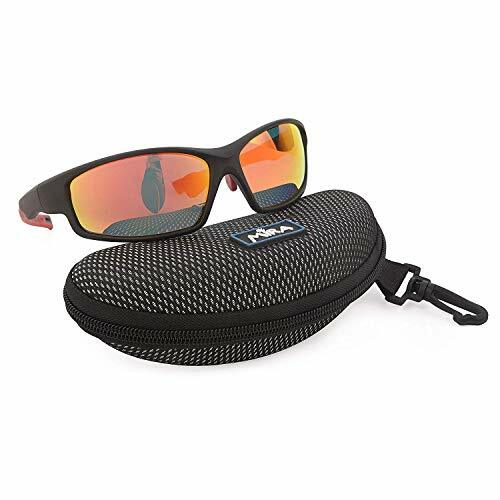 In this case, they fit the bill of an effective and reliable pair of fishing sunglasses, being polarized and designed for the outdoors. If you are looking for a useful pair of sunglasses to add to your tackle box, check out these shades by Mira and see their budget performance for yourself. These sunglasses have several features which make them a useful pair of fishing glasses. The first and most important aspect of these glasses is the fact that they are polarized. For those unfamiliar with polarized lenses, a brief synopsis is that they cut out a certain type of sun glare and are actually better at protecting your eyes from harmful rays. However, for fishermen, polarized lenses are unique in how they allow for a reduction of sun glare on the water’s surface, allowing you, in turn, to better see what lies beneath. Polarized glasses should be in every angler’s arsenal of gear because of this reason. On top of being polarized, these glasses are designed to be athletic and sporty all around. Their lightweight, flexible plastic design aids in durability and ensures they stay securely on your head. To further ensure they stay put, the straight arms of these sunglasses are coated with red rubber to help keep them in place along with the nose piece. You can definitely feel that they want to grip and stay put when placed on your face. When I put these glasses on, I appreciate the full coverage of vision they provide. No weird transitions into areas of your normal vision not covered by the glasses. Likely the most noticeable feature of these slick shades is their reflective orange lenses. On top of looking downright cool, they do a good job at offering full coverage of your vision. Despite being orange, they actually feature a cool blue tint for the user. Some may prefer that cool blue image over a warmer amber lens. I appreciate when a company includes necessary equipment with their products. These sunglasses come complete with a sleek, crush-proof zipper case and sunglass retainer straps to keep them from getting lost. On top of that, they even include a soft case for your glasses and a microfiber cleaning cloth. Polarized Lenses are an absolute must when it comes to sunglasses for fishing. Not only do they protect your eyes better but they essentially allow you to see through the water. I personally never go fishing without a pair of polarized lenses strapped around my neck with a sunglasses retainer. Oh yeah, another addition these sunglasses come complete with! Though these reflective lenses are orange when looking at them, for the user, these lenses turn bright sunny days into a cool blue image. Lightweight and Athletic designs make these sunglasses a great choice for outdoor activities. In the hand, they feel very light and somewhat flexible, which I imagine aids in their durability. To top off their athletic design, the arms and nose piece are rubber-coated and excellent at gripping your head and staying put. The straight arm design allows them to fit securely over hats as well. Necessary Accessories are not always included with sunglasses that have these features in this price range. On top of being polarized athletic-designed lenses, Mira includes several accessories. These include both a soft carrying case in addition to a crush-resistant zippered hard case. They also include a microfiber cleaning cloth and sunglasses retainer strap to ensure you don’t lose your shades and they stay securely around your neck. Narrow/ High-Set Profile: For my face type, personally, these sunglasses sit a little high and narrow. However, I generally do not pursue this sport-style of sunglasses due to my face type. I have worn others of this style and they fit in a very similar manner to others in their class. I do appreciate their full coverage of my vision, as any good polarized fishing sunglasses should. Limited Color Availability may be a deterrent to some people. These glasses are offered only in an orange reflective lens. However, for the user, they offer a cool blue image. Though for a polarized full coverage lens at this price, they are hard to beat. 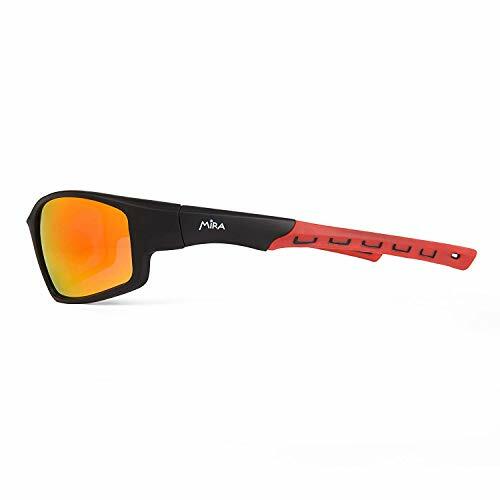 Mira describes these sunglasses as “Great for outdoor sports like cycling, kiteboarding, fishing, golf, hiking, volleyball, hockey, riding, basketball, driving, motorcycling, running, racing, skiing, trekking, and more”. I would certainly advocate adding fishing to this list. Being that polarized lenses are a necessity when fishing, in my opinion, these make a perfect candidate due to their overall design. Why else are these glasses good for anglers other than being polarized? Well, being designed for sports, they are very lightweight and designed to stay put. The rubber-coated straight arms and nose piece allow them to be worn with or without hats and they will maintain their grip, regardless. Their durable lightweight frames also feel somewhat flexible in my hands. Being an angler, I appreciate a pair of sunglasses that will have some give when I am storing them in a tight space like my wader pocket. Lastly, I appreciate the full vision coverage that the lenses offer in regards to fishing. Having all of my vision fully shielded and polarized is a nice feature to have for outdoor activities. I don’t much appreciate it when some of my vision is not within coverage of my sunglasses. There aren’t many negatives to be said about these sunglasses by Mira. For what I would consider an optimal budget price point, these sunglasses offer athletes and outdoor enthusiasts all the functional features they could really ask for. On top of that, they include accessories such as a hard case, soft case, and sunglasses retainer strap, all while staying on a budget price. Being lightweight, durable, flexible, and polarized, they fit the bill as a great pair of sunglasses for an angler or outdoor enthusiast. Don’t be out there fishing without a pair of sunglasses (and maybe a backup pair or two).